Melanoma is "-when something goes wrong in the pigment-producing cells that give color to the skin," but it is simply a mole that develops into cancer with too much exposure to the sun's ultraviolet rays. The scientific name for melanoma is "melanoma malignum," but melanoma is the common name. Melanoma is the most serious, if not, one of the most serious type of skin cancer. So melanoma is no laughing matter. 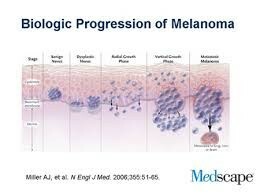 As mentioned before, melanoma is caused by too much exposure to the sun's ultraviolet-a and ultraviolet-b rays. It could also be genetic. The more members you have with melanoma, the more likely you are going to get it. Anyone can get this disease, but there are some people that are more likely than others. For example, if you have many moles throughout your body, you are more likely to have melanoma. People with unusually shaped, or large moles, you will have a better chance of getting melanoma. 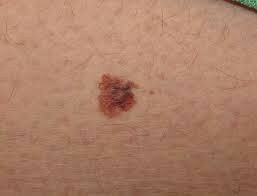 Most birthmarks such as the common port wine stain, or strawberry marks have no risk of developing into cancer, but a very rare type called congenital giant melanocytic nevus, can develop into melanoma. People who are very fair skinned or that have red hair, can have a higher risk of skin cancer. People with darker skins can also get melanoma, but have more natural protection against it. Melanoma is commonly found in Australia and in New Zealand. These two places have the highest reported rates in the world. There are many symptoms of melanoma which include itching, bleeding, feeling pain, growing mole on your skin, unusually looking mole that does not look like any other mole (the ugly duckling), non-uniform mole which has an odd shape, uneven or uncertain border and is different colored. You diagnose melanoma with biopsy. In this procedure, all or part of the suspicious looking mole is removed, and a pathologist analyzes the cancer. To treat melanoma, you surgically remove the skin tumor, and some of the normal skin around it. Melanoma cannot be cured, but as stated before, it can be removed with surgery. Melanoma is fatal. Many people die from it every year. There were 2148 deaths from melanoma in the UK in 2012. "Facts about SKIN CANCER." Facts about SKIN CANCER. N.p., n.d. Web. 16 Mar. 2015. "Skin Cancer Facts." Skin Cancer Facts. N.p., n.d. Web. 12 Mar. 2015. "Skin Cancer Foundation." Skin Cancer Facts. N.p., n.d. Web. 14 Mar. 2015. "Melanoma Risks and Causes." Melanoma Risks and Causes. N.p., n.d. Web. 16 Mar. 2015. "Can Melanoma Skin Cancer Be Prevented?" Can Melanoma Skin Cancer Be Prevented? N.p., n.d. Web. 16 Mar. 2015. "DermNet NZ." Melanoma, Malignant Melanoma. N.p., n.d. Web. 16 Mar. 2015.